The Student Symposium serves as a venue for some of our most engaged and accomplished students to share their work with peers, parents, community and others. It demonstrates the remarkable range of interests pursued in and beyond the classroom. Symposiums provide a unique opportunity for students to present their research, broaden their ability to share the research in creative ways and build a foundation for secondary and postsecondary learning experiences as well as careers. The origin of the Student Symposium dates back to 1995, at which time Dr. Katherine James was elected president for the second time, having served in that capacity in the mid-80’s. As the chapter searched for fresh program ideas, one thought that occurred to her was that in addition to presenting professional speakers at our meetings, we needed to listen to the students. We usually don’t take time to do that in our professional gatherings, and students of all ages have a wealth of ideas to share with us. Thus, the idea of a student symposium was born. 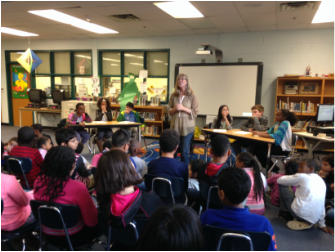 The goal was to arrange a panel discussion featuring four to six students representing various grade levels from elementary to high school and from different jurisdictions. We identified three topics from which each participant could choose; these topics were intended to be current with issues of the day, such as the emergence of technology in schools, school violence, and school uniforms. The topics varied from year to year, but some themes prevailed with a bit of updating, as we can see! At that time, there were several PDK members who were principals, and they were asked to select two or three students from their schools to participate. Initial student symposia included students from Ross Elementary (Gloria Smith), Rudolph Elementary (Thomas Jones), Shepherd Elementary (Dr. Katherine James), and Anacostia High School (Dr. Mildred Musgrove). A date was chosen for the event, and students began to prepare. In later years, we tried to schedule the symposium in November, during American Education Week . The first few symposia were held at The American University, our sponsoring institution. Dinner was included, and at times students would provide brief entertainment as well (e.g., The Emeralds of Shepherd Choir). As time went on, other venues were chosen, including the Martin Luther King Library, the Sumner School, and other schools. More and more schools began to participate, as our chapter grew and the members reached out to their own schools. The formats changed a bit as well; some symposia featured students of only one level (e.g., elementary) or one school; on one occasion, students presented a debate; on another occasion, the presentations were competitive; in recent years, the symposia were held during the school day so that teachers and their classes could attend; for the past two years, the symposium has taken place at Ridgecrest Elementary School (Hyattsville, Maryland) during the evening hours so parents could attend more easily. The chapter has hosted a reception and provided small school supply prizes to recognize the students’ efforts and participation. Our chapter members have become more and more involved, often going to the schools of the students who would be presenting and assisting them with understanding the event and planning their topics. Members have also donated their time and talents in offering guidance for science expos, Read Across America celebrations with students, preparing certificates, rewards, and gifts for the students, as well as for their teachers and principals. But the true rewards have always been the enlightenment we adults have gained from listening to the youth and their creative, unrestricted ideas and opinions about the education milieu in which they learn and the recommendations they have for making things better, as well as the opportunity given to the students to express themselves and gain experience in addressing groups of people who value their ideas. We are trying to track those students who have participated. We know, for example, that some who were involved in those early years have gone on to college and careers. Perhaps they will help to shape education policy in the years to come. Our annual Student Symposium is indeed an event that can influence the future, and it has become a cornerstone event for The American University Chapter of Phi Delta Kappa International. PDK Celebrates 16 Years of Encouraging Student Voices!